Often mistaken for its freshwater counterpart (unagi), anago is saltwater eel. 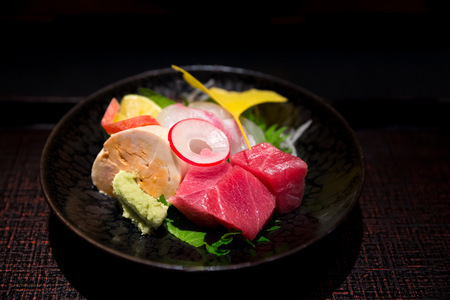 As sushi, anago is never served raw, always cooked, and usually simmered in a broth made from repeated cooking of eels over time. 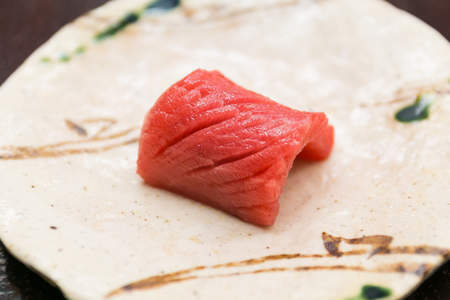 When served, the reduced broth (called tsume) is brushed over the nigiri. 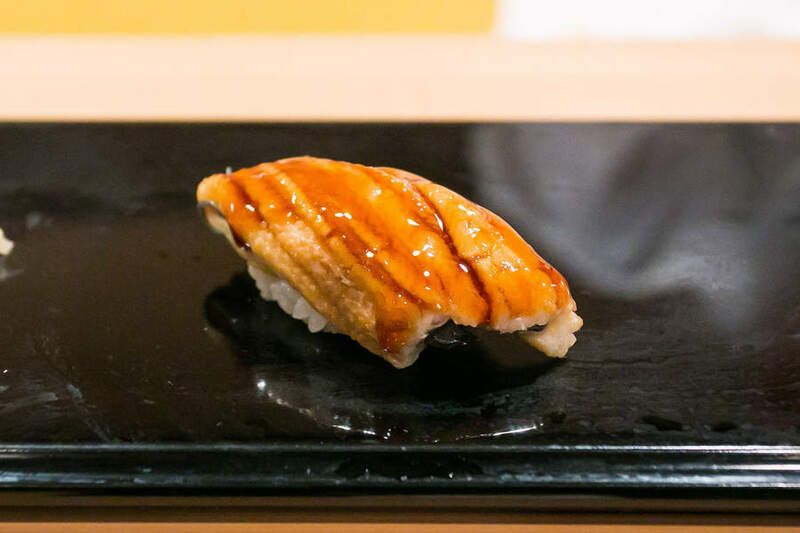 Tsume replaces soy sauce entirely so the sushi instead has a sweet barbecue-like flavor. Because anago is always cooked, it tastes very much like any other cooked barbecue fish. 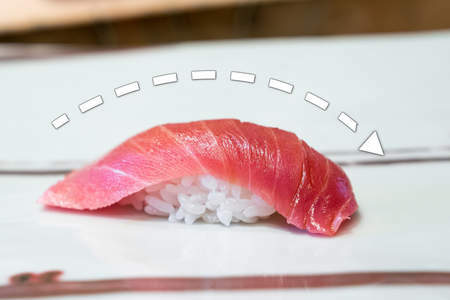 With the rice, which is usually a tad larger than other nigiri, it can feel very filling. Anago is lean compared to very fatty unagi, but is still a fatty fish. The fat breaks down while simmering so the meat becomes very soft and feels “fluffier” than unagi, which tends to be more dense and chewy. 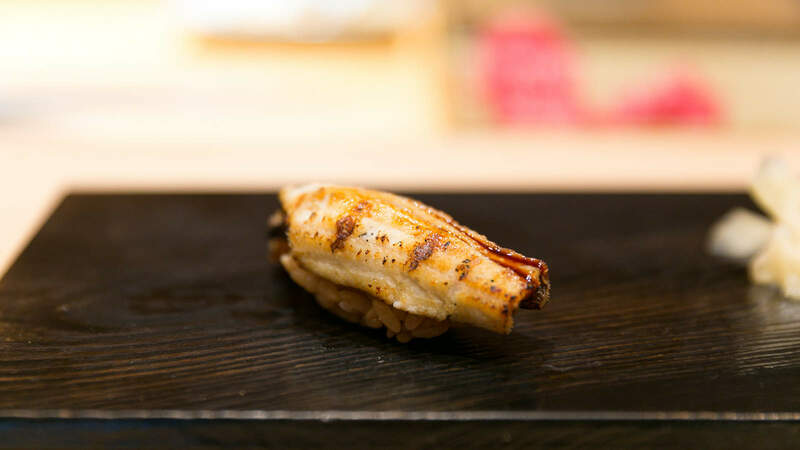 Anago meat tastes sweet, especially with the concentrated tsume eel sauce brushed on top. The tsume reduction should be thick from the collagen in the eel turning into gelatin after a long simmer. Occasionally the anago will be grilled or seared, but those cooking methods are more often reserved for unagi. Preparing eel can be a very smelly process if proper care is not taken. 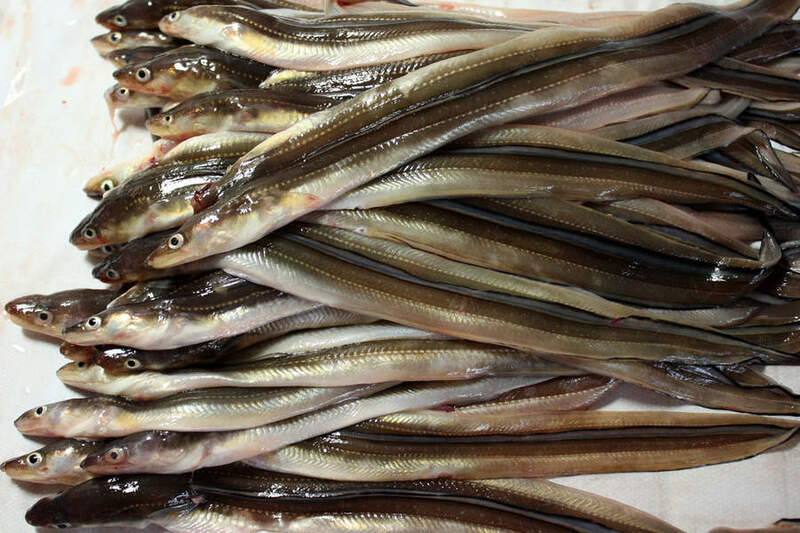 After the eels have been caught, the best fishermen will leave them in a tank for 1-3 days to empty their bellies. Only then should they be killed, when the smell is minimal. Anago and unagi have very long bodies which makes them very difficult to maneuver when slicing open. Sushi chefs use a tool called me-uchibo, a spike hammered through the head into the cutting board, to hold the fish in place. They slide the blade along the backside of the body, grazing the spine to allow the flesh to open outward. The best preparation of anago can only come from a sushi shop that has been in business for a very long time. It is almost always simmered in a “mother broth” that started as a simple mixture of water, shoyu, sake, salt, and sugar. Over time after many eels cooked in the same broth, it develops a deeper and richer eel flavor. Once a sushi apprentice leaves his master, the master will sometimes bestow some of the shop’s tsume on him. When he starts new broth from this mother, it is possible to develop vintages several decades old. 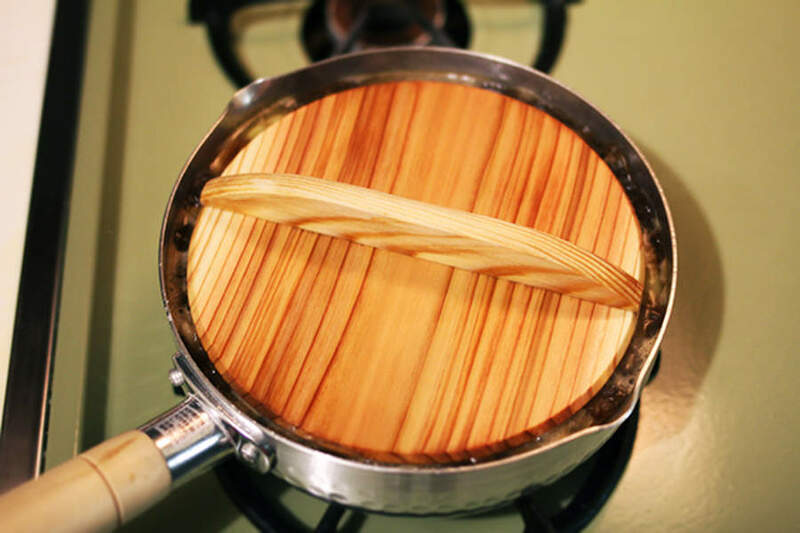 While simmering the eels, a chef will use an otoshibuta cypress lid. It floats on the top of the water like a raft to keep the eels submerged, prevent too much evaporation, and stop vigorous bubbles from shredding the fish apart. After 20 minutes over a medium simmer, the anago can be removed, strained, and cooled. It should be very tender at this point, practically melting in your mouth. 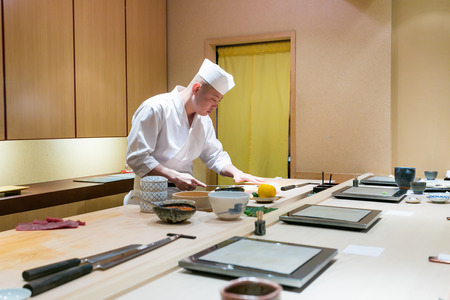 For sushi, the chef cuts sections from the body, forms a larger ball of rice, shapes the sushi, and brushes the reduced tsume sauce over the eel. All eels used in anago sushi are fish with elongated snake-like bodies with small dorsal and pectoral fins. Anago for sushi may be one of many different species but is most often ma-anago (Conger myriaster). Their elongated shape allow them to snake into small crevices. The animals are nocturnal, hiding during the day and coming out to feed on small fish and crustaceans at night when they are caught. They are a very muscular fish and, even hours after being killed, can keep their bodies writhing thanks to their many nerves. This is why the best sellers will “live-finish” them, called ikejime, which prevents the muscles from stiffening up. 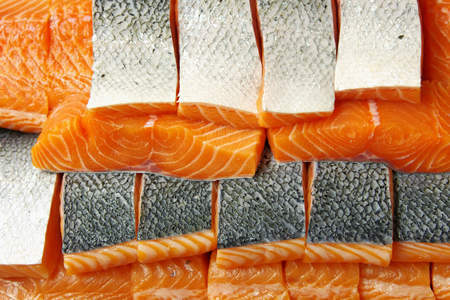 It is also this quality that makes eels associated with long life for those who eat them.